How Do You Spell Lanyard? Home » Spelling Dictionary » How Do You Spell Lanyard? 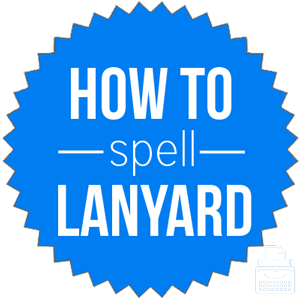 Spelling of lanyard: lanyard is spelled l-a-n-y-a-r-d. This can be tricky as the yard part of the word is not fully sounded. It can also be spelled as lanyard, although this is less common. Definition of lanyard: A lanyard normally refers to a chord that is worn around the neck to hold an item such as a key, identity badge, or whistle. In the military, a lanyard refers to a piece of rope used to trigger a piece of weaponry. It is also the nautical terms for a piece of rope used to secure, raise or lower something such as a ship’s sail or a flag on a flagpole. Pronunciation of lanyard: Lanyard is pronounced lan-yurd. I would like to order some blue, customized lanyards for an upcoming event. Feed the lanyard through deadeyes to extend the shroud. Lanyards are often used for security reasons to display identity. When you enter the music festival your lanyard must be on show at all times. They may also be used to aid people with organization. I put my keys on a lanyard, which will hopefully stop me losing them! According to Merriam-Webster, lanyard entered the English language in the 17th century. In Middle English, a lainer was a strap used for fastening clothing or armor. In Old French, a laniere also refers to a leather strap. Lanyard is a noun that most commonly refers to a chord worn around the neck which has been designed to hold an object. It may also be used to refer to a loop of rope in nautical or military contexts.